What could be better than a cool pool on a baking hot day in Swindon! And with the summer finally a scorcher, we've made a list of all the best places to enjoy the water in Swindon! Yes, believe it or not, there is a beach in Swindon, and a blue flag one at that. 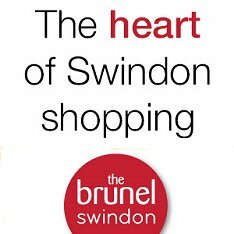 For those who haven't noticed, Swindon has one of the biggest water parks in the world right on its doorstep. 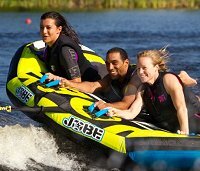 And with the temperatures rising nicely, the opportunity to have some fun on the water at Cotswold Water Park (and in it) is surely too good to miss. 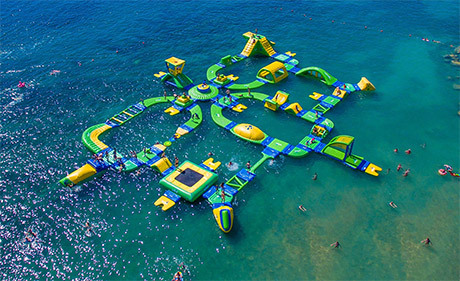 A brand-new AquaVenture Park is now open at Cotswold Country Park & Beach. The fun facility will initially be open 10am-7pm (last admission 6pm) but will be open later during the summer holidays. And while you're at it, no bombing either. Ahh, the delights of an afternoon down at the local swimming baths. Sadly none of which are open-air in Swindon anymore unless you're happy just splashing about at Coate Water. It may not be completely open-air like it used to be, but, both sides of the pool building do retract, opening on to sun terraces. And there's even a diving board for those who are a little more adventurous. 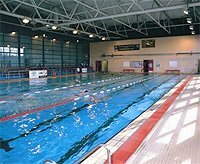 We couldn't mention swimming in Swindon without mentioning the Oasis Leisure Centre. A place where you can rediscover your inner youth when sliding down the Domebusters. They have an indoor lagoon which is fun for all ages, home to 3 giant waterslides, an indoor open-topped water slide, as well as hydro-slides, wave machine and water cannon. And for the younger ones there is a learner pool, with 'The Jolly Soaker' Pirate ship and an elephant slide for the under 8s. Two steam rooms, a spa pool, a cold plunge pool, 3 inter-connecting hot rooms and two swimming pools - what says relaxing more than the Health Hydro! And while your there why not enjoy a Turkish bath! It's an ideal way to unwind both your body and mind, relieve stress, improve blood circulation and muscle tension whilst cleansing the skin - we're in! The Link Centre is home to Swindon's only 25 metre deck level competition pool. With the bikini season just around the corner what better way to swim lengths than at the Link Centre. There are also fun 'float' sessions to keep the children amused. FREE interactive splash park for children, with water-spitting dragons and flowers is open every day from 11.00am to 5.00pm from late May until September. The site has been designed for children up to the age of 12 but there is no formal age restriction. Open seven days a week, the Ridgeway Leisure Centre is the also the perfect place to enjoy a swim. With a 25 metre pool, the centre has a great timetable of activities to meet every swimmers needs! Check out their website below for more details. Cricklade has a family-friendly pool at the heart of its Leisure Centre. Lessons are available throughout the week for all levels of swimmer, including babies, toddlers and adult learners. Sessions include Adults Only, Fun and Floats, Tots Swim, Rookie lifeguarding, Aquafun little mermaids, synchronised swimming and 50 . The pool is also available for Party Hire at the weekend. For more information visit the Cricklade Leisure Centre. Or as close as we can get to it! Yes, we know. Swindon is a good 80 miles from the south coast, but hey, it could be worse. 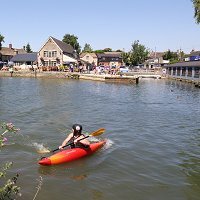 We've got the Thames just down the road at Lechlade and some pretty spectacular lake-side places to enjoy. Sure to be packed when the summer sun's out, down by the riverside in Lechlade is a great place to spend a afternoon soaking up some rays - and maybe a swim. You can also rent rowing boats too and canoes if you fancy a paddle down the river. Some even start jumping into the Thames from halfpenny bridge when it gets too hot, not that we don't recommend that sort of behaviour, of course (see link below for bridge jumping gallery). Or, if you would prefer to watch it rather than participate, why not sit in the garden at The Riverside, Lechlade. Owned and run by Arkell's Brewery, is the perfect Thameside location for drinks and food. You may not be able to jump off the hi-rise diving board, but, you can enjoy the calm surroundings with a BBQ or a picnic. Voted 'Swindon's favourite place', we would like to recommend a splash around in their paddling pool - but it's shut! Sailing isn't a rich man's sport, you know! Have a go yourself at tacking and jibbing at the Bowmoor Sailing Club just outside Lechlade. A poser's sport if ever there was one - until you fall in flat on your face and come to the surface gargling like a baby. We've tried it - and can definitely vouch that it's... absolutely brilliant fun! Just watch the vid if you don't believe it. > Waterskiing - watch video! This is one of those sports that looks easier than it looks - and probably the most addictive thing we've tried out. But don't let our desperate efforts to make it 20 yards put you off. If there's one thing this summer you must try at the Cotswold Water Park, this is it. Fantastic fun! You've probably had a go on holiday, so why not laugh at your mates getting thrown in to the water here in Swindon! Not just for kids, this is another massively popular activity and brilliant fun for a birthday, stag, or hen party or if a group of friends just fancy an afternoon getting wet. The 12-person watersled is brilliant! 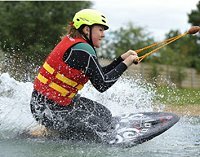 During the summer months, Waterland offer a huge range of fun days on their lake at the Cotswold Water Park. You can learn to windsurf, sail, kayak or canoe, have a go at raft building - and even learn how to drive a powerboat! 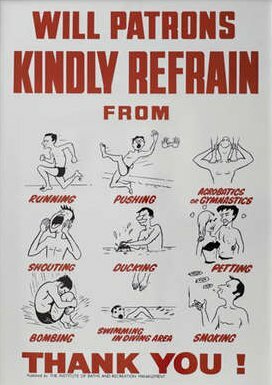 Remember the rules when you're having a swim, especially if doggy paddle's the best you can do.